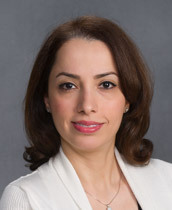 Dr. Azadeh Khezri attended Medical School at Tehran University of Medical Sciences and did her residency at Saint Barnabas Medical Center in Livingston, NJ. Dr. Khezri was recognized in 2011 by the Journal of Rheumatology as distinguished intern of the year. She also placed in the top 10 for the National Medical School Entrance Exam. Dr. Khezri is married with two children and loves to travel the world, attend cultural events. She also loves to cycle and play tennis. Her medical interests include incorporating better nutrition to prevent disease and promoting health.